Your home is overflowing with chocolate, your kids are asking when you are going to the Easter Show and just as you were recovering from the summer break, school holidays are almost on top of you again. That's right! It's Easter! Around this time of year I head to the stores and fill up a few shopping bags with eggs for everyone but this year I thought I would do something different. I'm making my own cards! 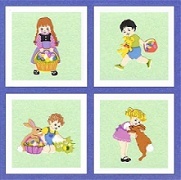 It's a hectic time for most of us, so here are a few quick and effective techniques for making your own Easter cards. Even your kids can make these! The card on the left one was made with Sandylion Easter Kids stickers. Each sticker was placed on a square piece of green cardstock, matted on white cardstock and then arranged in a square on a purple cardstock card. This sweet card was made with Suzy's Zoo Bunny With Flowers stickers and Bazzill Basics cardstock. Bazzill Basics cardstock was chosen to give the card texture. I began by making a card out of the purple cardstock. Two yellow cardstock pieces were then cut and adhered to the card. The stickers were added last (note: the two small butterflies come as a single sticker but were cut out to suit the design). As an added touch, the large butterfly sticker was stuck to a piece of white cardstock, cut out and then adhered to the card with a pop-dot. This makes is stand out from the card and gives it a three-dimensional feel. Why not try making tags instead of cards? Your scrapbooking friends will love you! Not only do they get a sweet tag for Easter, but they can use it as an embellishment in one of their own layouts later. It's a great way to make sure your gift is kept forever. Just make sure you use photo safe pens when writing your Easter message. This tag uses Suzy's Zoo Spring Chicks stickers. To begin, a tag was made from green patterned paper. It was torn into two sections and matted on a yellow cardstock tag. The chicken sticker was then added to the bottom piece and sparkly yellow fibre wrapped around the top. The flower stickers were placed on cardstock, cut out and adhered to the tag to give some depth. 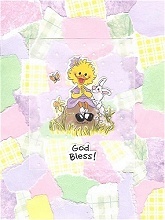 Finally, the Easter Blessings sticker was placed on a rectangular piece of yellow cardstock and placed on the top section of the tag. The edge of the rectangle was highlighted with a green pen. To finish it off, more yellow fibre was threaded through the hole at the top of the tag. If you are looking for something more sophisticated, try this sweet card. It was made using the techniques used to make serendipity squares. Scraps of pastel cardstock (green, pink, purple and yellow plaid) and complementary patterned papers were torn into pieces and placed haphazardly over the front of the card. A piece of white dot vellum was cut and Suzy's Zoo Suzy With Bunny stickers arranged on top. The vellum was then adhered to the card. I used Zig glue to adhere the vellum but only placed it behind the stickers so it would not show through. You could also use vellum adhesive for more coverage. These are just a few quick designs to get you started. They were all made with simplicity and speed in mind so even the most time-pressed scrappers can whip up something this Easter.